This is unusual, and typically Update Rollups will not require access to the source files. 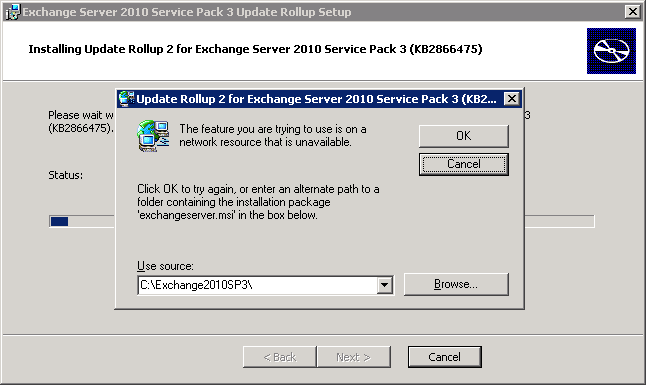 However, you can of course download Exchange 2010 Service Pack 3 and extract to the location you performed the update from. Update: If you’ve attempted to install via Windows Update and see error 8024002d this may be the underlying cause. ← Episode 26 of The UC Architects is now available! are there any other problems with RU2 we should know about. ive been doing some searching and i haven’t found many people with issues. Im tryn to determine if ther are any show stoppers. currently on SP2 still but wanting to move to SP3 as long as there arent any issues that could potentially stop mail flow, or client connectivity. I was having the same issua, I had to turn UAC to never notify, reboot, and patch went in smoothly. I wish this was the only issue. I’m not even getting that. Installed from the .msp file on the desktop: says it’s stopping services, they stay running, it rolls back, dies with “Installation failed due to an error.” I’ve got all logging “voicewarmupx” turned on, I still cannot find any evidence of what exactly is happening. I am getting really, really, really sick and tired of building a new Exchange server, getting it up to date, and migrating all my mailboxes and public folders to it, because updates refuse to install for one reason or another. My success with Exchange updates is probably around 20%, the other 80% I end up building a new server and migrating. There has got to be a better way to do this. Forgot to mention, of course it installed from WSUS the first try with no problem at all, when I did it in my test lab. It’s only production servers I get to have all this fun with. I agree the quality of updates has been.. poor.. to put it mildly. I’ve not had the same amount of issues you’ve had, nor do I see customers with the same either. Personally I *never* use WSUS for Exchange Update Rollups. I don’t trust it for that; Windows Updates sure – but not Update Rollups. With Exchange updates in general, make sure you definitely install as an elevated user, and disable ALL virus scanning and agents (e.g. SCOM agent, DPM agent, Scheduled PowerShell scripts, Forefront etc). Kill off all MMC.exe processes and PowerShell processes. All in, I’ve installed Exchange Service Packs and Updates hundreds and hundreds of times. I was a TAP participant on 2010 SPs so oversaw many builds across a large Exchange environment deployed very regularly in addition to Cumulative Updates. I deploy Exchange Service packs and cumulative updates to customers regularly, and I work in a team where one of us will be putting a Service Pack into a strange customer environment (as a pre-req) on probably a weekly basis.. I honestly could count the number of times it’s screwed up on one hand. That said if you don’t have a Database Availability Group, patching Exchange is scary! Rebuilding a broken Exchange Server might only take a few hours, but it’s not something you want to have to do and I feel your pain. 4 or 5 times out of hundreds is still too many times for me! I think Michael B Smith posted a guide on Exchange patching which gives some good tips some of those similar to mine, I’ll see if I can find it. Here it is. It’s a similar list to mine above. I’d suggest it for CUs and others; Also check out this article as Cert Revocation Checking might be a cause of some issues too. Thank’s for sharin the solution.